Showdown on the ice at the Pepsi Center, Denver. A specialty tire for winter driving will give you added grip on snow and ice. Don’t be the guy who spins out, gets stuck in a snow bank, or just stays home because of bad weather. All-wheel or 4-wheel drive is a solid foundation to safe winter driving and winter tires complete the package. Is there a difference between a general purpose tire and a winter specific tire? 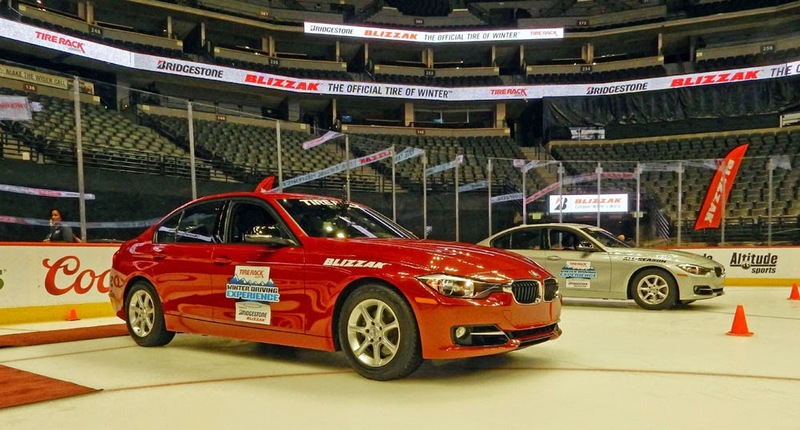 I drove BMW’s equipped with “all-season” tires and Bridgestone Blizzak WS80 winter tires on the ice. There is a huge improvement in grip with the winter Blizzak tires. The video below that I produced shows a red BMW 328i with Blizzak tires outperforming the silver BMW with all-season tires under acceleration, braking, and cornering.